1. Forgetfulness. As in the person got to the race or the gym and had an “oh crap, I forgot my gear” moment and just made due with what they were wearing. 2. Commitment to a cause. Remember Josher and Denim for a Cure? Where have you been, Josh? 3. Dedication. Think not wanting to break a run streak. 4. Cultural differences. Yeah, not everyone in the world can afford $40 running shorts. But there is a reason I forgot: love, friendship, and/or support. Janae’s (aka Hungry Runner Girl) sister ran miles 20.5-26.2 of the Utah Valley Marathon with her IN JEANS AND FLIP FLOPS! I guess we COULD put this in the Awesomeness category – ’cause, yeah, her sister is awesome. But I like my new “Love, Friendship, and Support” category. How about you? h/t Judith, So Very Slightly Mad blogger, for being the first to let me know about this! When your friends tease you, come see me. If your friends tease you for doing something awesome IN JEANS, come see me. I will love you and support you in your jean-wearing awesomeness. 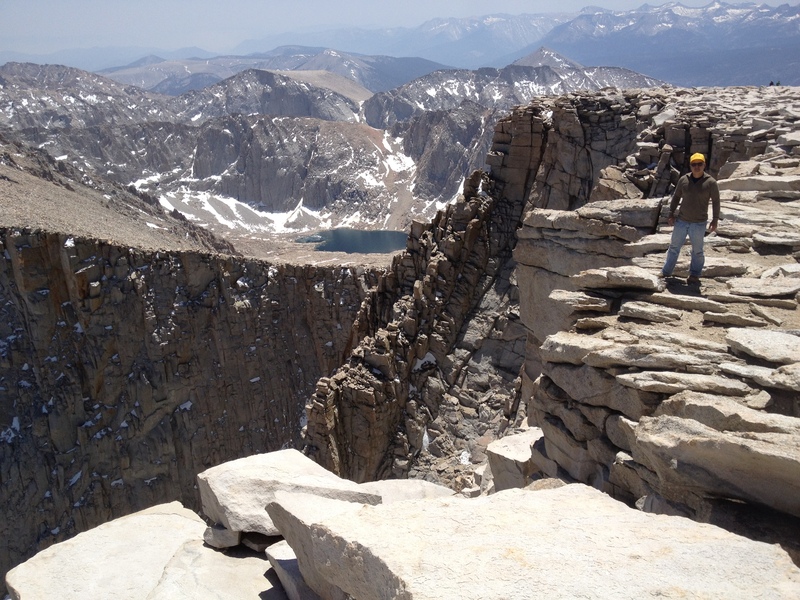 Last summer I hiked the highest peak in the lower 48 – in jeans. My friends made fun of me the whole way. The final day is dedicated to all the rest of you! You are ALL my favorites. Whether you did a jog in jeans once, think that some day you might try it, or just laugh along with us – you are the best and I love all of you. Just as you are. Don’t change one little thing. But I gotta list a few people by name. 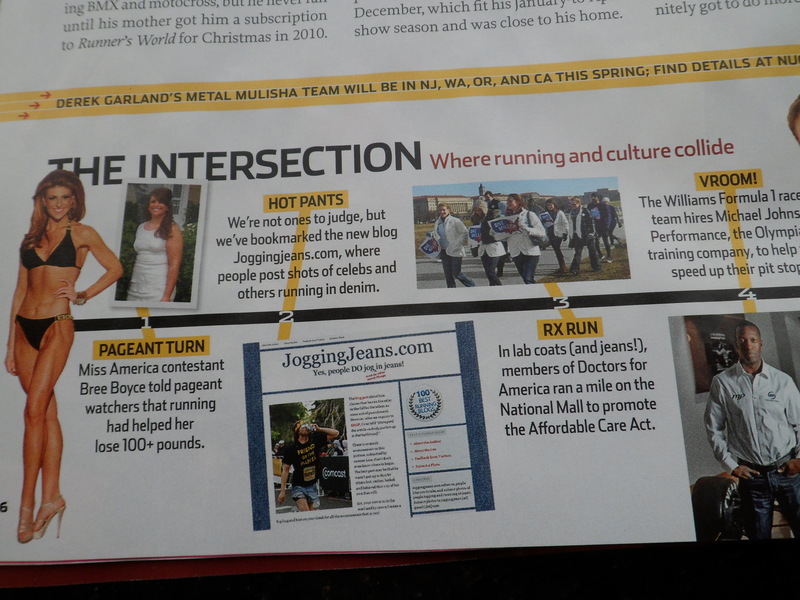 Thanks for promoting and appreciating the jogging-in-jeans cause in the way that you do. And, yes, I’m hoping you come to the ‘Burgh some day. Charla: She nabbed a PR running in jeans, writes me poetry, and is always scoping out jean-wearers at her races. We ARE going to run a race together some day – I am sure of it. Jorts House Mafia members: How awesome would it be to be IN A PICTURE with Brian #2 in his underwear in front of the Point State Park fountain? Minka: If you read her blog, you’ll know that she is incredible and the type of person that you want to have around you. Elisa: Another person that you want to have in your circle. Plus she sends me jean-jogging pictures all the time AND she doesn’t live THAT far away for a Pittsburgh trip. Jen: I don’t want her to just visit, I want her to move to Pittsburgh so we can be real friends. Anyone who announces her pregnancy to the blogging world in this way is clearly awesome on so many levels. Whitney: She’s “racing the states” and hasn’t yet ran a Pennsylvania race. Hoping it is Pittsburgh some day! And we’ll go to the zombie store together. Mary: I love her. My #1 site commenter! Woot woot! I realized, while making this list, that there are oodles more of you that should be on it. So I’m calling this “Dedication Week – Part 1.” All of you, if I find out that you were in Pittsburgh without a heads-up…well, let’s just say that I better not find out [scrunched up nose and vicious evil eyes looking at Y.O.U]. You can see all of the past posters that are motivating you to jog in jeans here. No jean-jogger list would be complete without Josher. His stats say it all: in 2012, he ran 17 races in denim (!) – a 5K, a 10K, 15 half marathons, and a marathon. He also is planning to run all his 2013 races in denim – all in the name of raising awareness and money for breast cancer research at Huntsman Cancer Institute through Huntsman Hometown Heros. Check out the new Denim for a Cure website and his new Team Denim initiative. Go ahead, clickity click on over there and see what he’s got goin’ on. Hey, Josher! Pittsburgh Marathon? Some day? 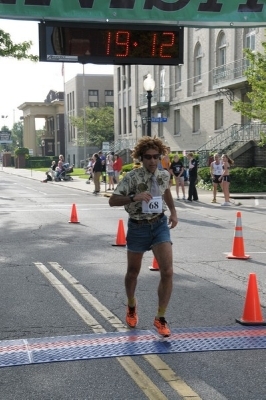 The next featured runner of Dedication Week is another Dan who DEFINITELY is advancing the running-in-jorts cause. 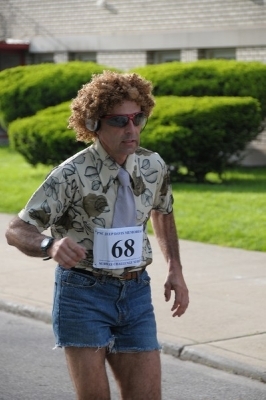 The best thing about Dan is that he brings smiles to the faces of race spectators and JoggingJeans.com viewers with his monikers, outfits, and sense of humor. Reminisce with me, will ya? And then there was the moment when I found out that “Fabulous Jorts Man” was the same guy as the Dannys above. Mind. Blown. And another great thing? Pittsburgh’s Great Race (a 10K on September 29th) is on Dan’s race calendar this year!! Come on! Come to Pittsburgh! Everyone is doin’ it! We continue with our week of posts dedicated to my favorite jean-wearing joggers. If you’ve been paying attention, you all know about Tracey and her blog, Stride and Joy. Let’s face it, it is tough being a running blogger – mainly because there are 50 bazillion of them all doing and writing about the exact same thing in pretty much the exact same way. I feel strongly that Tracey’s “hook” isn’t her race streak (although it IS incredible) but, rather, it is that never – not once – has she ever taken herself or her running too seriously. Every week, she laughs at herself and her love/hate relationship with running and permits us to laugh along with her. In the 52 races she ran in 52 weeks in 2012, she has had numerous opportunities to scope out jean-wearing runners and boy did she come through for us. And these two new photos taken during races #50 and #52. The best thing about Tracey and Andrew? They are coming to Pittsburgh to run the Pittsburgh Marathon!! Won’t you join them? I’m dedicating this first full week of 2013 to my favorite jean-joggers. The dedication week is because I love the guts of these people and they have done a lot in 2012 to further the running-in-denim cause. It also may be about buttering up some of the people that I wish would come to Pittsburgh and run one of the races here. The Pittsburgh Marathon is May 5th and Pittsburgh’s first Rock ‘n’ Roll Half Marathon is August 4th. Actually, I wish all of you would make a special trip to run the streets of my beautiful city and so we can meet each other in person. Mark your calendars. Start saving your nickels. Email me if you have plans to visit and want to get together for a ‘hey.’ Creepos need not respond. Day 1 is all about Dan. 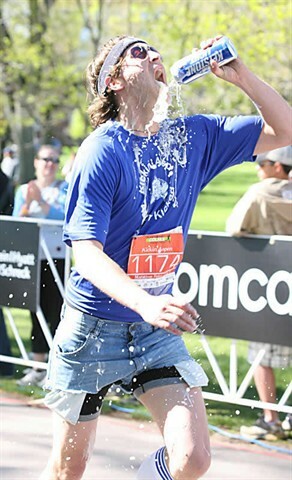 The Dan that ran two of his 12 marathons in 12 months in 12 states in 2012 IN JEANS. The Dan that grew a mustache for me and sends me pictures of others running in jeans and race signs. The Dan that got his own fan club here at JoggingJeans.com due to his incredible amount of awesomeness. That Dan. And I’ll say it one more time: step off. …from all the love I have for jean cupcakes! Notice the detail: the stitching, the cuffs, the really worn pair with all the creases on the left, the stiff new pair with minimal creases. So much LOVE! The girl who made these is a cupcake-making GENIUS: Facebook pics. Blog. Thanks, Cori, for making my DAY! While I love receiving your pictures, I love just as much hearing about the “misses” – you know, when you see the person jogging in jeans and think of me. 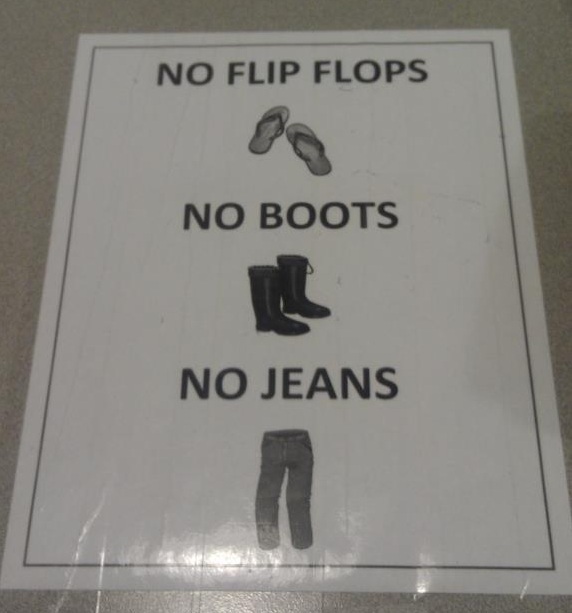 “NO JEANS”!? What fun is that? And Jennifer, My Lesson in Motivation blogger, who saw these jean-inspired ski pants. They are water-resistant ski-pants that look like jeans! $765 of $1000 raised!! 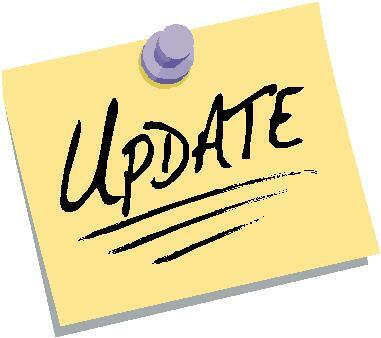 Donate to by clicking here. Josher received his Denim for a Cure t-shirt in the mail yesterday.